Juniper ham Villgrater approx. 500 gr. Craft high-class ham with juniper crust, cooked, lightly smoked with aromatic juniper taste. Very well suitably as an hors-d'oeuvre or main food. marinated garlic in olive oil with chili peppers. Taleggina Oro Cheese Dairy Zani ca. 300 gr. Soft cheese bovine milk, Appearance: White mould attempts - cream-white dough, Smell: white mushrooms, Taste and aroma: mawkishly - sourly - straw aromas, Consistency and structure: creamy - softy, Maturation: approx. 15 days in the climatic chamber. Barolo Vigna Cicala - 1989 - Aldo Conterno 148,25 EUR / 197,67 €/lt. Barolo Vigna Colonello MAGNUM - 1989 - 1,50 lt. - Aldo Conterno 523,65 EUR / 349,10 €/lt. Pomerol DOPPELMAGNUM - 1989 - 3,00 lt. - Château Clos René 315,50 EUR / 105,17 €/lt. Barolo Vigna d'la Roul MAGNUM - 1989 - 1,50 lt. - Rocche dei Manzoni 262,90 EUR / 175,27 €/lt. Pomerol DOPPELMAGNUM - 1990 - 3,00 lt. - Château Le Gay 523,65 EUR / 174,55 €/lt. Brunello di Montalcino Riserva MAGNUM - 1985 - 1,50 lt. - Capanna 349,80 EUR / 233,20 €/lt. Riesling Pittermännchen Kabinett restsüß - 2017 - Johann Baptist Schäfer 25,40 EUR / 33,87 €/lt. Serpico Rosso - 2003 - Feudi di San Gregorio 35,35 EUR / 47,13 €/lt. Barolo Bricco Rocche DOPPELMAGNUM - 1989 - 3,00 lt. - Ceretto 558,45 EUR / 186,15 €/lt. Giro Rosé trocken - 2018 - Kühling-Gillot 15,85 EUR / 21,13 €/lt. 1. Cru Classé Pauillac - 1989 - Château Mouton-Rothschild 537,55 EUR / 716,73 €/lt. Tomatoes San Marzano D.O.P. Set 6 x 400 gr. - Premium Despar 12,20 EUR / 0,51 €/100 gr. Dried Tomatoes in Olive Oil 314 ml. - L'Orto di Beppe 7,60 EUR / 2,42 €/100 ml. Tomatoes San Marzano D.O.P. 400 gr. - Premium Despar 2,40 EUR / 0,60 €/100 gr. Garlic in olive oil 314 ml. - L'Orto di Beppe 7,80 EUR / 2,48 €/100 ml. Tartufata Black Truffle Sauce - Cream 85 gr. - Calugi 10,80 EUR / 12,71 €/100 gr. Bag with Dried Tomatoes 200 gr. - Calugi 6,95 EUR / 3,48 €/100 gr. Pane Carasau D'Ogliastra Carta Musica 250 gr. 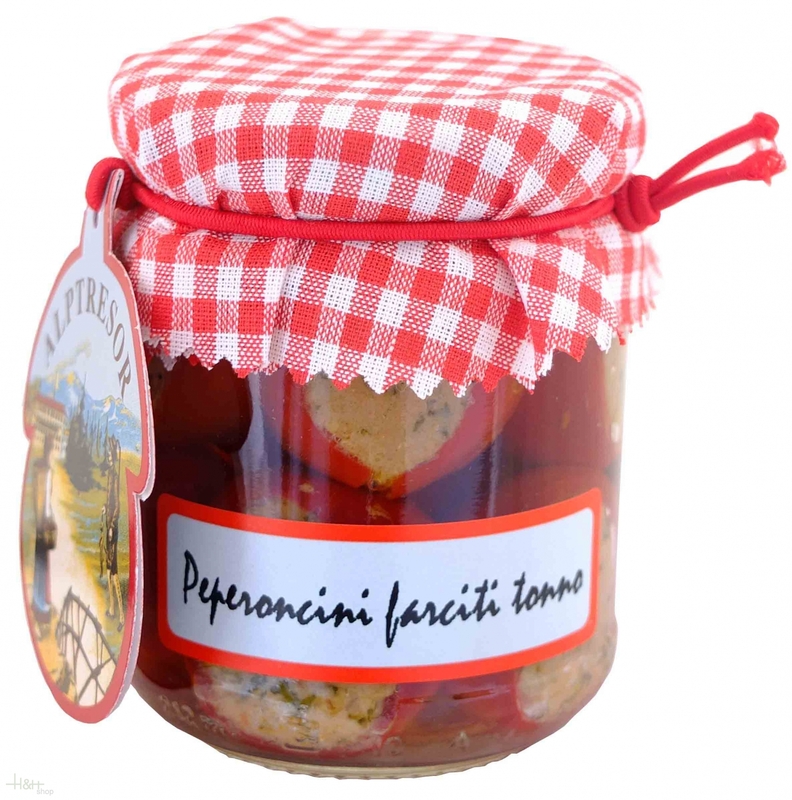 - Ferreli 5,15 EUR / 2,06 €/100 gr. Whole Artichokes in Oil 3100 ml. - Calugi 62,15 EUR / 20,05 €/lt. Pickled Garden vegetables 310 gr. - La Baita 13,50 EUR / 4,35 €/100 gr. Honey with White Truffle 40 gr. - Calugi 10,80 EUR / 27,00 €/100 gr. Filled Chili Peppers w/ Anchovies/Capers 190 ml. Alptresor/Rocca 14,15 EUR / 7,45 €/100 ml. Filled Chili Peppers With Tuna 212 ml. Alptresor/Rocca 12,25 EUR / 5,78 €/100 ml. Garlic with Chili Peppers in olive oil 314 ml. - L'Orto di Beppe 7,80 EUR / 2,48 €/100 ml. Mushroom Fantasy / Insalata di Funghi 212 ml. Alptresor/Rocca 9,70 EUR / 4,58 €/100 ml. White Truffle Sauce - Cream 50 gr. - Calugi 9,35 EUR / 18,70 €/100 gr.